Our doctors have over 50 years of combined dental experience, so you are sure to be in safe hands at Bonita Point Dental Arts! 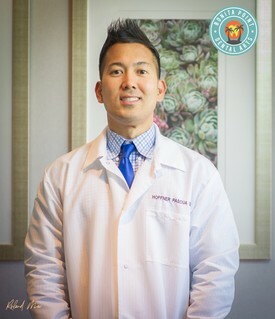 Dr. Hoffner Pascua has been practicing dentistry since 2007. He did his continuing education at UCLA. He is a member of American Dental Society, California Dental Association and San Diego County Dental Society. Dr. Pascua got married to Cassidy on Valentine's Day and they have a daughter named, Harper. In his spare time, he likes to draw, play sports, travel to different parts of the world and walk their three Chihuahuas. I am very grateful to be a dentist. Growing up, I thought I would be an artist, because I loved to draw, create and build things with my hands. I am glad that being a dentist allowed me to continue my passion in the arts by creating beautiful smiles. It is my goal to improve the overall health of my patients that will have positive impact for the rest of their lives. I value all my patients and hope to develop a long-lasting dental relationship. Steven H. Ferriot was born in Columbus, Ohio. He received his Bachelor of Science degree from Ohio University and his Doctor of Dental Surgery from The Ohio State University. After serving on active duty in the U. S. Navy for two years, he and his wife, Jeanie, decided to make San Diego their home. Dr. Ferriot has practiced in Bonita since 1973 and made his home here since 1974. He and his family have witnessed the many changes that have occurred over the years in our quiet little valley. Dr. Ferriot is a member in good standing in the American Dental Association, the California Dental Association, the San Diego County Dental Society and numerous dental honorary organizations. Dr. Ferriot has several areas of dentistry in which he has special interest. He particularly enjoys restorative and cosmetic dentistry, as well as complex treatment that often includes the restoration of dental implants and coordination of treatment with specialists. His hobbies include travel, photography, snow skiing and golf. Dr. and Mrs Ferriot have been married for over 45 years and have three children and two grandchildren. She enjoys listening to her patients and finding their best treatment options. One of her "hobbies" is taking continuing education classes to stay current in the dental field. 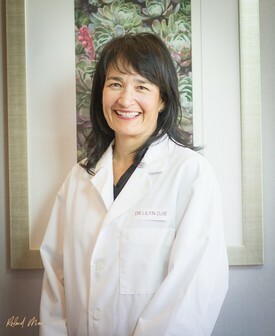 As a native of Southern California, Dr. Djie enjoys being outside, spending time with her family, swimming, tennis and traveling.